The owner’s manual for my 1967 Alfa Romeo GT 1300 Junior calls for the engine valve clearances to be checked every 18,000 kilometers. According to Google Calculator (before Google Calculator I would have used my slide rule), that’s every 11,185 miles. Coincidentally, I’ve put almost exactly 11,000 miles on the Alfa since purchasing it in March 2013. So in part to prepare for what is anticipated to be a very busy 2019 driving season, and in part because I really don’t know when this was last done, I decided to check all 8 valve clearances (4-cylinder engine, 2 valves per cylinder equals 8 valves). Accessing the valves and followers is the simple part. This overhead-cam engine has its two camshafts at the very top. 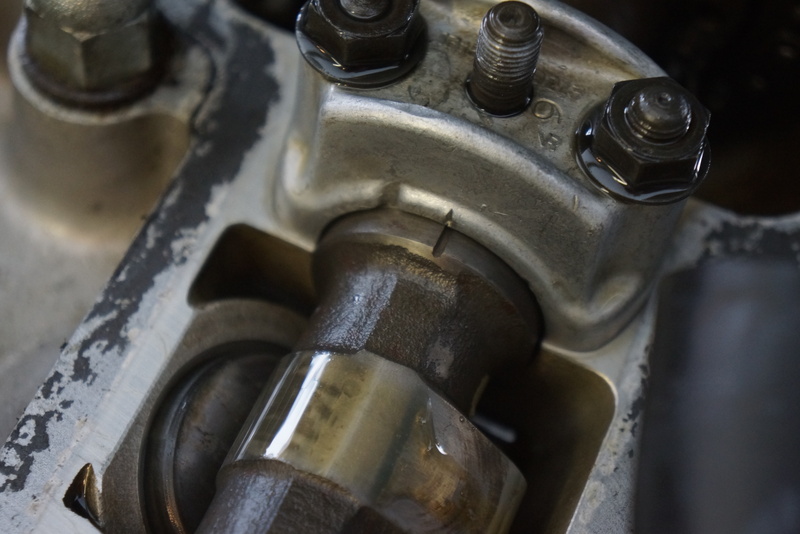 The valve cover can be removed once the spark plug leads, air hose, and the top of the intake plenum are out of the way, which is a 10-minute affair. 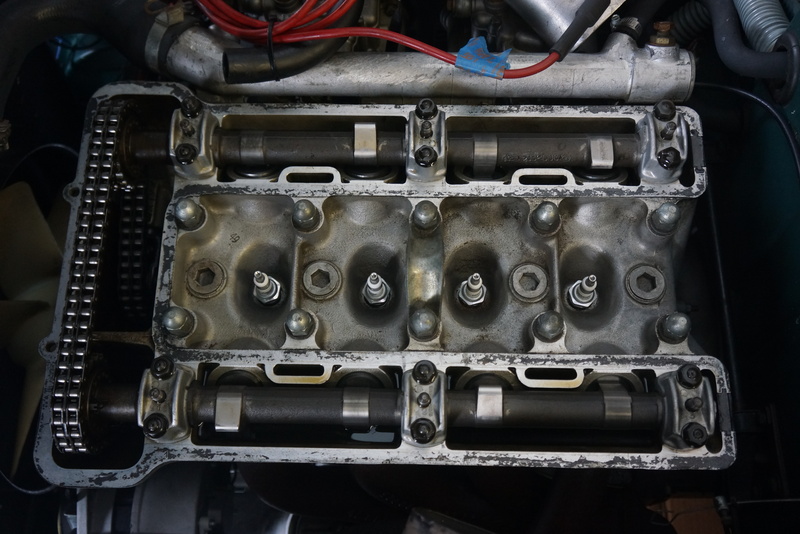 The valve cover is held in place by 6 large Allen screws along the top, and two bolts at the front. I had never had the valve cover off this engine before, and my first reaction was one of pleasant surprise at how clean the engine looked. My first task was to find the camshaft part numbers, to verify that these were Alfa Romeo cams and not some hot aftermarket replacements (in which case the clearance specs would be different). A prior conversation with Pete, the family friend who sold me the car, revealed that he wasn’t sure what cams were in it. The part numbers of both cams were readily visible, and verifying them against my technical literature confirmed that these are indeed the factory cams. Now it was onto the actual clearances. To rotate the engine, I first tried getting a socket on the crank pulley bolt, but the fan shroud blocked that. The next-easiest way to spin the engine was via the nut on the front of the alternator. Popping out the plugs provided less compression resistance, and some moderate thumb pressure on the alternator belt was all that was needed to get the crank and cams to spin. 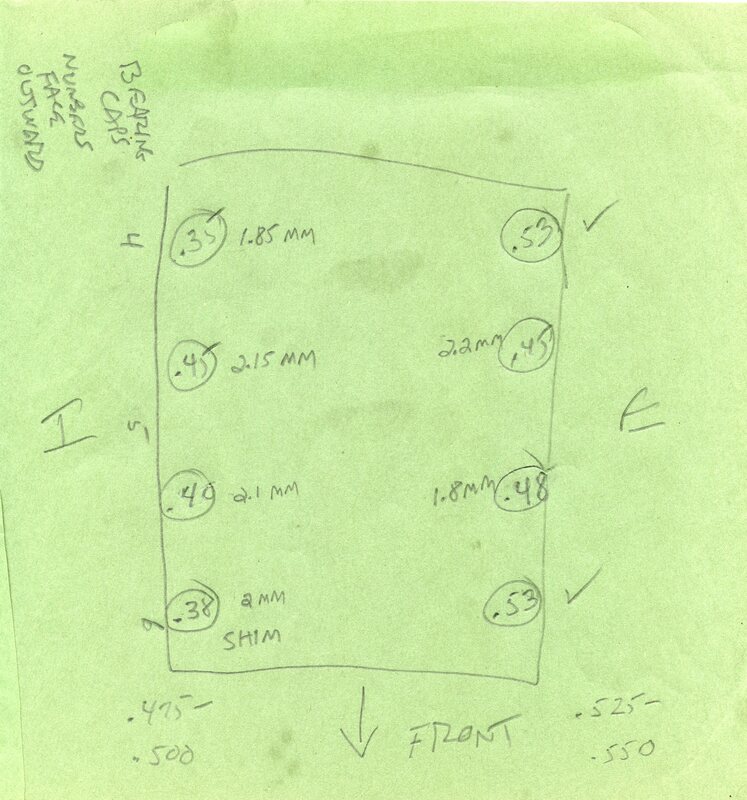 Paper and pencil at the ready, the valve clearances were checked in firing-order order (1-3-4-2) and recorded. 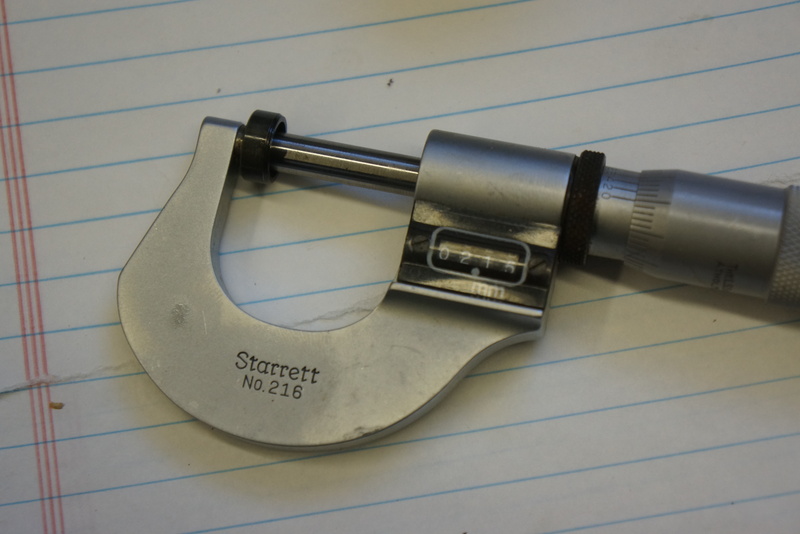 While my owner’s manual provides specs in both millimeters and inches, I decided to stick with the metric measurements – I have metric feeler gauges, and the needed shims are sold in metric sizes. 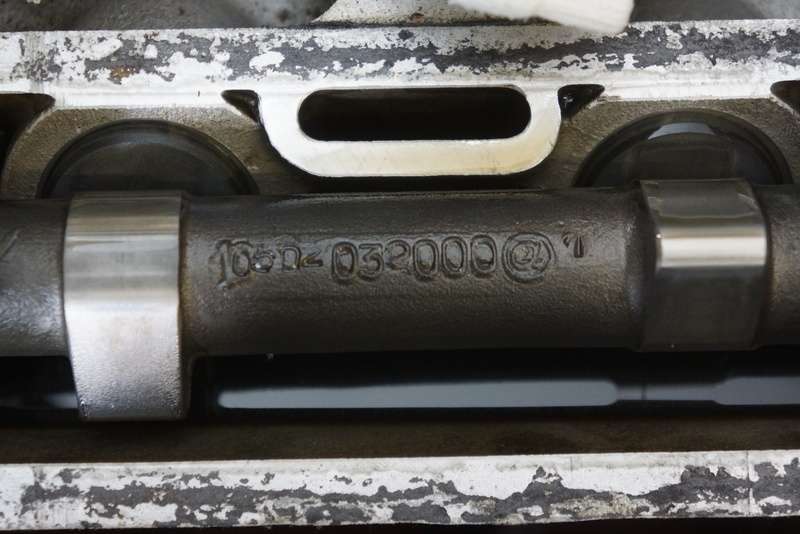 The spec for the intake valves is 0.475-0.500 mm, and the exhaust spec is 0.525-0.550 mm. 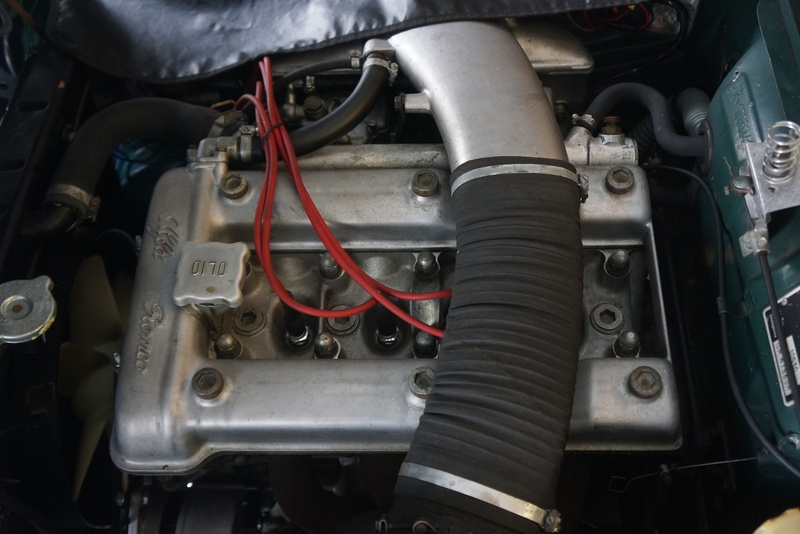 Six of the eight valves were out of spec: all 4 intakes and 2 exhausts, and, all 6 showed too little clearance, meaning the valves were not seating completely, subjecting them to less cooling since they were not making full contact with the valve seats. The worst measurement was #4 intake: 0.350 mm, meaning it was 0.150 mm too tight compared to a correct outer range of 0.500 mm. Yes, we’re talking fractions of a millimeter, but specs are specs, and I felt that the clearances should be corrected. Here is where it got interesting. My Alfa engine was originally designed in the early 1950s. It’s a very sophisticated layout, with not only overhead cams, but all-aluminum block, wet cylinder liners, hemispherical combustion chambers, etc. 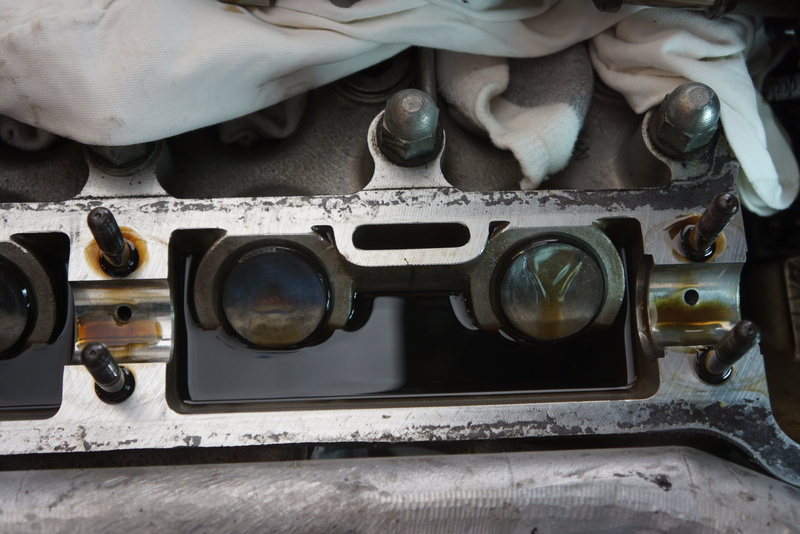 However, like most other OHC engines of its time, adjusting the valves requires removing the cams to allow access to the followers (buckets) and shims which are under the buckets. Most friends to whom I mentioned this procedure looked at me with a combination of horror and pity. “It’s really easier than it sounds” I would retort, which did nothing to alleviate their sympathy for me. 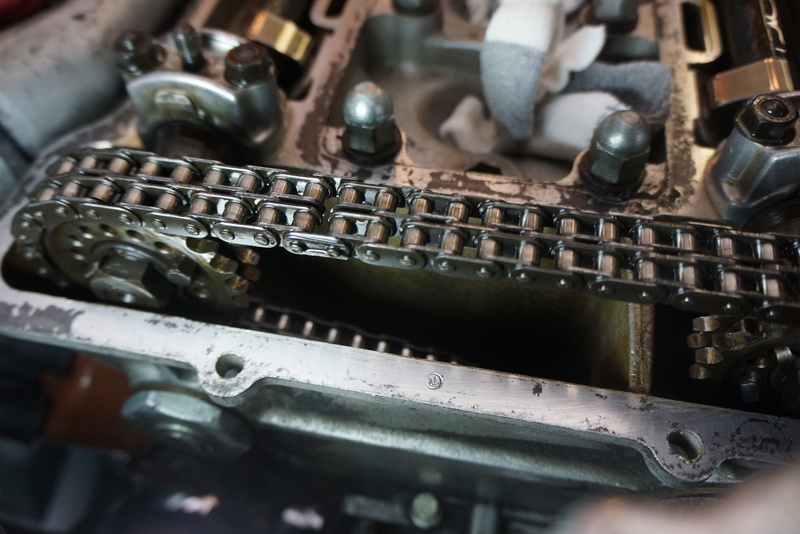 The official Alfa procedure calls for locating the timing chain’s master link, disconnecting it, and swinging the two chain ends out of the way. 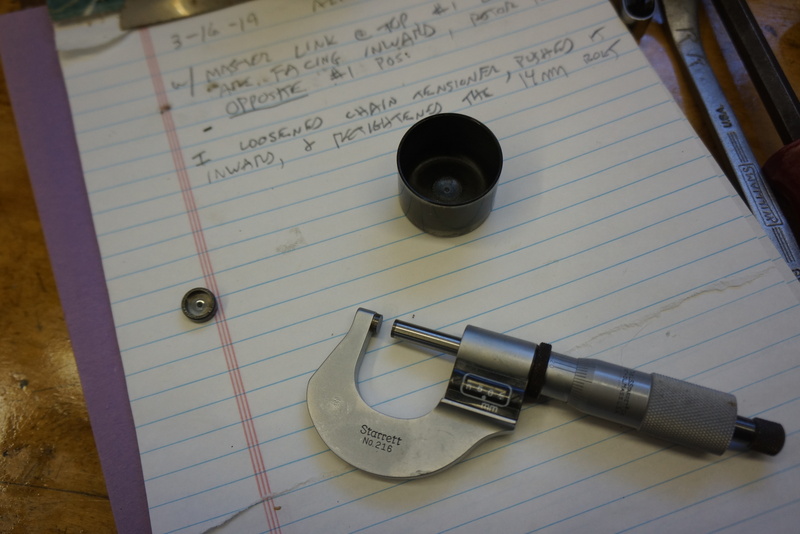 This method opens the possibility that the cam timing would need to be adjusted at reassembly. Of course, some very clever people have devised a work-around. One of the service books I own is the Alfa Romeo Owner’s Bible, written by the late Alfa expert Pat Braden. He describes a method that does not involve unhooking the chain. 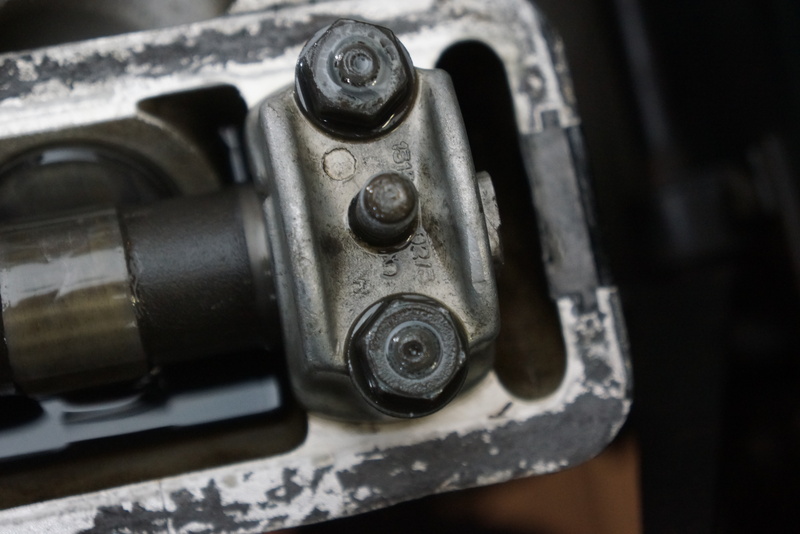 Instead, he suggests loosening the chain tensioner, pushing the tensioner all the way IN (making for a loose chain), locking the tensioner in this position, and then lifting the cams toward the center of the engine without disturbing the cam sprocket/chain connection. In this way, on reassembly, the cam timing does not change at all. Ideally, this is done with both cam timing marks lined up with the bearing cap marks. This is exactly what I did. With the tension off the timing chain, I started on the intake side and removed the 3 cam bearing caps (Alfa thoughtfully numbers the caps 1 through 6, and I documented everything with photos before turning the first nut). 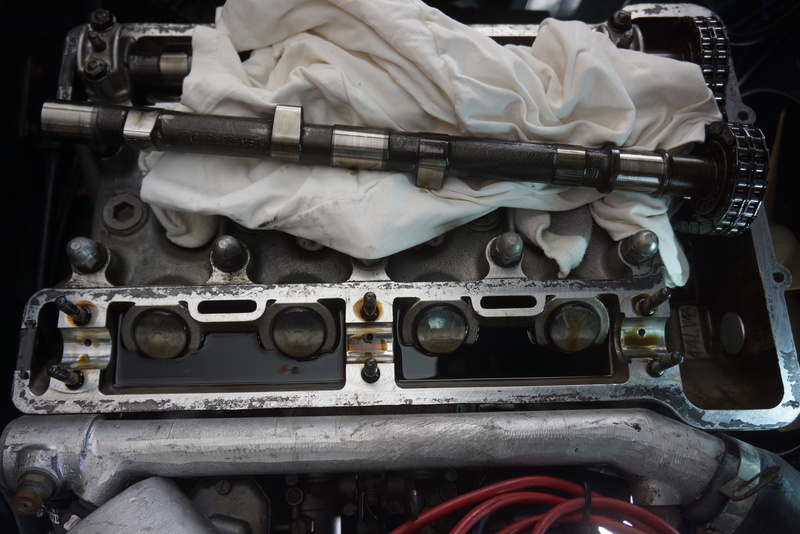 The intake cam was lifted and placed over the spark plug holes (which were protected with clean rags). The chain remained on the cam sprocket. The next trick was getting the buckets out, as they were oil-covered and lacking a way to grab them. I realized that a magnet might do the trick, and it did. The bucket came out, and under it was the shim, which was also removed. These slippery guys were tricky to remove! Working on just one cylinder at a time so as not to mix up any of the locations, I measured each shim with a digital metric micrometer. The value was recorded on the same sheet of paper as the clearances. I started on the #1 intake valve, went down the line to the #4 intake valve, then did the same thing on the exhaust side. Once all these measurements were taken, the shims and buckets were back in place on the engine. I gently placed the valve cover on top of the engine, lowered the hood, and took my measurements inside so that the ‘new’ shim sizes could be calculated. I knew that all the out-of-adjustment valves were tight, so I needed greater clearance, so all the new shims needed to be thinner than the current shims. I found an online “Alfa shim calculator” someone built in Excel, and I used it, but I also checked all my numbers two more times. 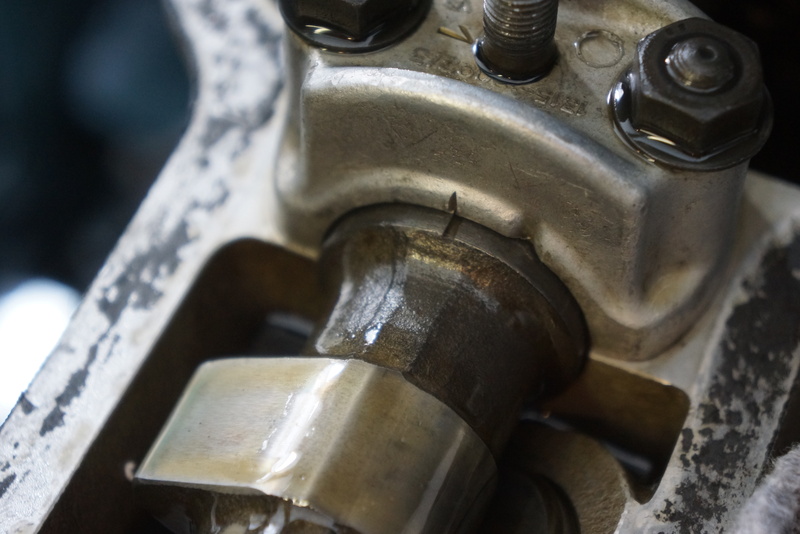 I aimed for the higher end of the spec, figuring that if the valves are tightening up over time, I had best start by providing the maximum clearance while remaining in spec. My go-to Alfa supplier, Classic Alfa in the UK, sells shims in increments of 0.125 mm, so it was a fairly easy task to calculate my needed shim sizes. The order was placed, and now I just needed to wait for the shims to show up. But it certainly felt like the hard work was behind me!